Providing those enrolled on our 12 week courses with more studio time. Taking place in our Peckham Levels studio. 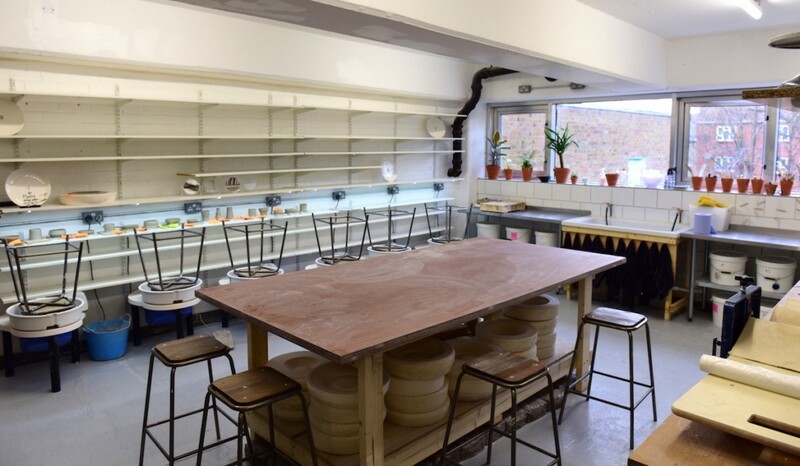 We have expanded our Peckham Levels studio to provide those on our courses with the option of additional access, outside of class hours. Perfect for people who would like time to practice but who aren’t able to make the most of a full membership. There won’t be a teacher onsite however there will be a technician to answer basic studio questions. This also provides flexibility as you only pay when you come to the studio and don’t need to book in advance! The cost for a session is £20 and allows a maximum of 4.5 hours access on a particular day. To start with we’ll be opening our doors Mondays, Wednesdays and Fridays 1pm-5:30pm. Anyone who is on a 12 week course at Peckham Levels or Bellenden Rd is welcome to drop-in. Easter opening hours: Open Good Friday, NOT open Easter Monday. Open access times: Mondays, Wednesdays, Fridays 1pm – 5:30pm. Clean-up starts at 5:15pm. No need to book, just come along whenever you like during these open access times. You must be registered on a 12 week course and on your first session you will have a 5 minute induction of the space. 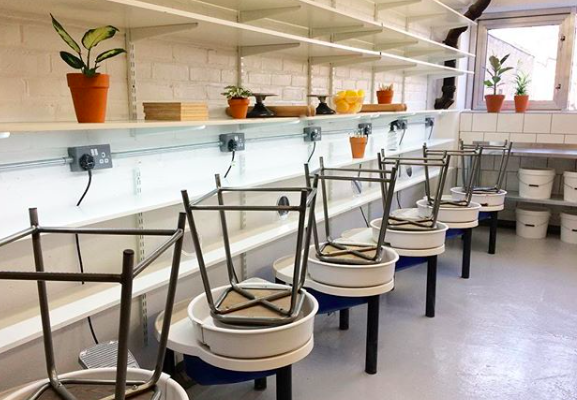 You’ll have access to the following: aprons, work areas, basic tools, potters wheels, a range of clays, in house glazes, extruder, slab roller, onsite technical support, free tea & coffee and wifi. Any work fired will be charged at the standard rate. You can use the shelving space of the course you are enrolled on and there will be additional temporary communal storage. Work can be kept on the communal shelves for 1 week only. More info in the T&Cs below. Payment: £20 a session, cash and card accepted. 1 payment cannot be split over several sessions. Whether you stay 4.5 hours or 30mins the fee is the same – it is not possible to pay for a shorter period of time. However, you would not be charged if you wanted to pop into the studio for 5 minutes to wrap up a piece of work you made a few days earlier. These sessions are in addition to scheduled course times and cannot be used as a substitute for any missed class time. If you miss a class on a 12 week course it is not possible to attend a drop-in session free of charge, the fee remains £20. Open access times: Mondays, Wednesdays, Fridays 1pm – 5:30pm only. If these session prove popular we will introduce additional access times on weekends. All work stops at 5:15pm and the clean up must start then. It’s important that you spend at least 15 minutes cleaning the area you have worked in. In the event of somebody not leaving their work area in a suitable condition we will issue a warning, and if this were to happen regularly we could refuse access. Bank Holiday Mondays: open as usual. Who can come: You must be registered on a current 12 week course to attend and have completed at least the first 4 weeks of a course with us. It’s important that you are comfortable working independently. On your first session you will have a 5 minute induction of the space from a technician. You will be given an info sheet which must be read and understood before work starts. It is not possible to invite guests to the studio. Shelving space: You can use the shelving space of the course you are enrolled in for small amounts and there are additional temporary communal storage shelves. On the communal shelves work must be labelled with your name and the date. Work can be kept on the communal shelves for a maximum of 1 week only. Work left any longer will be thrown out. In terms of wrapping work we will try to keep an eye on the shelves, however we encourage people to take responsibility for their own work (if you were to pop in for 5 minutes to wrap work you will not be charged). Marking your work: If you are on a course at Peckham Levels please use the same number as that of your course. If you are from Bellenden Rd you will have to use a stamp so that technicians can identify it. This will all be explained during the induction. Materials cost: This will work the same as it does on your course. Any work fired will be charged at the standard rate of £5 per 1kg for stoneware and £10 per 1kg for either porcelain, crank or black vulcan. Technical support: There will be onsite technical support with someone to answer basic studio questions, however unlike during a class there will not be demonstrations.